Pretty soon it will be time to take the kidlets' Picasso portraits off the wall in the school hallway to make room for spring art. I am going to miss walking through a Picasso gallery every day. First we looked at some of Picasso's portraits. 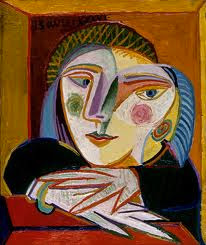 and played on a couple of online Picasso portrait sites - Picassohead and Paint your own Picasso. I owe huge thank you to wonderful art teachers who share their expertise in their blogs - Mary from MaryMaking and Patty from Deep Space Sparkle. 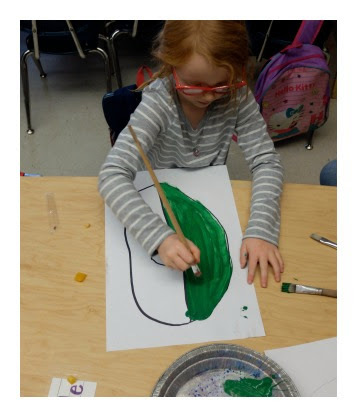 Without their willingness to share their expertise through their blogs, I would not have know where to start to bring Picasso to kindergarten kids. We broke down the creative process into steps. 1. 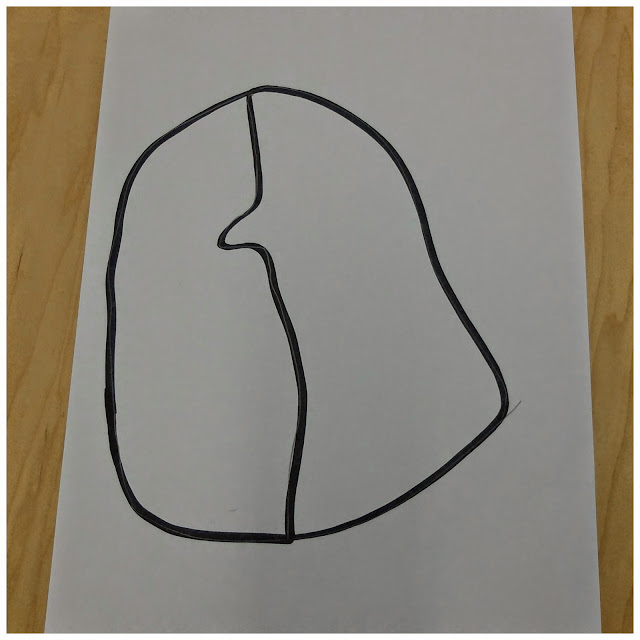 Draw a large oval on a piece of 11x17" paper. 2. Draw a line down the middle of the face, making a nose and chin bump. I traced over the kids' lines with a black marker. 3. The kids painted each side of the face a different colour. 4. 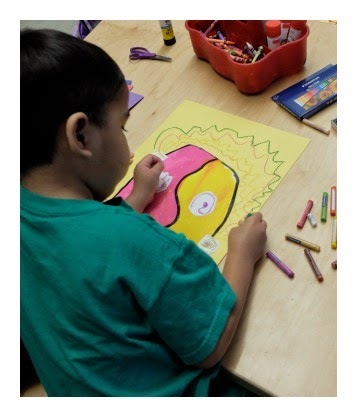 We looked at different Picasso eyes, mouths and ears. 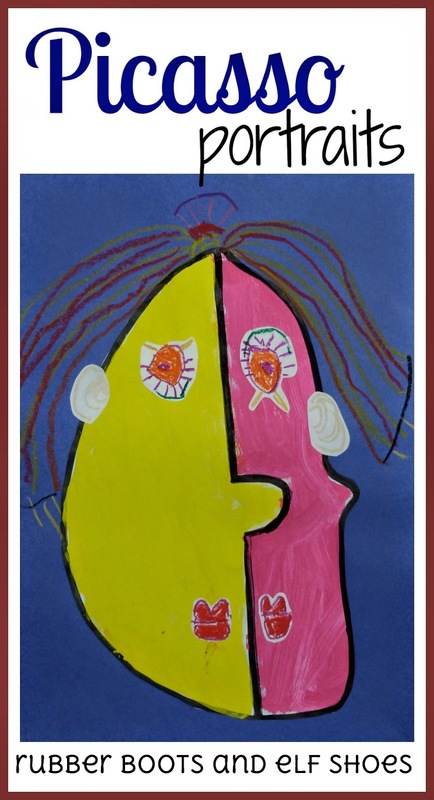 The children drew the facial features on separate papers with pastels. 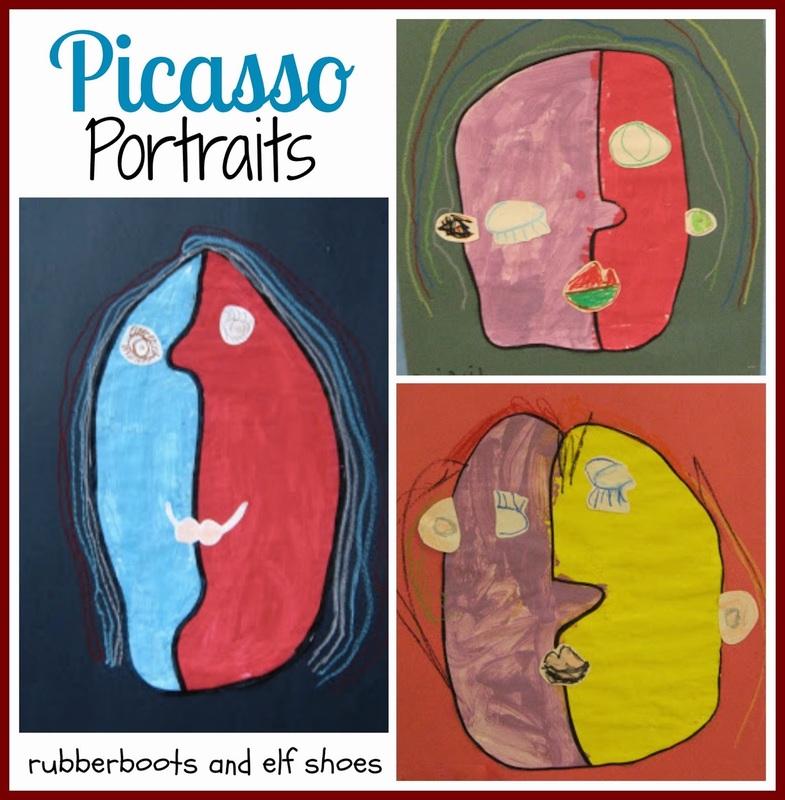 We cut them out, and the children decided where they would go on their Picasso faces. 6. The face was cut out and glued onto a piece of coloured paper. (Last year we only used black background paper; this year we used bright colours. Both have their advantages. 7. The children used pastels to draw hair, and signed their work. The kids amaze and delight me with their creativity and expression through art and how it becomes part of their vocabulary and how they experience the world. As Picasso said, "Every child is an artist. The problem is how to remain an artist once we grow up". THIS is the COOLEST ever!!! 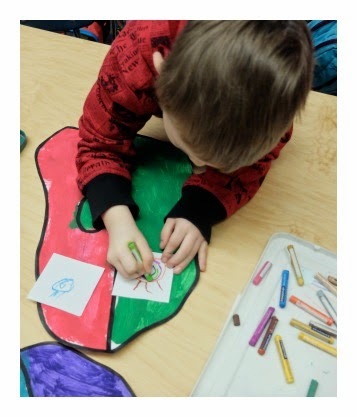 I am going to have to try this with my cub scout when we do the Artist Activity Pin next month! I love this! I'm always looking for really easy art tutorials and I can't wait to try this with the kids. Loved it, pinned it, thanks for sharing! This is awesome!! 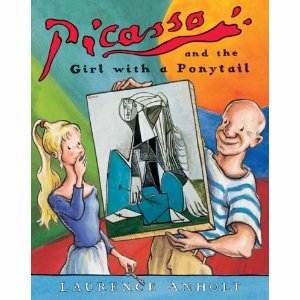 I have wanted to do a Picasso project with my kids, but I haven't given enough research to getting started. This is inspiring!